Jan 04, 2010 (LBO) – Welcomed the New Year in Dhaka. In Bangladesh, one cannot not think about population. Outside the city states, Bangladesh has the highest population density in South Asia, and indeed the world. Greater Dhaka alone has close to 13 million people, almost two-thirds the population of Sri Lanka. Fertility and population growth have fallen rapidly in recent times, but people still talk about population as a problem here. It is a problem for Bangladesh as well as all South Asian countries, but not simply in terms of raw numbers. Modern scholarship suggests that population structure is what requires attention. If we define the working population as being 15-64, it constitutes 70 percent of the total. 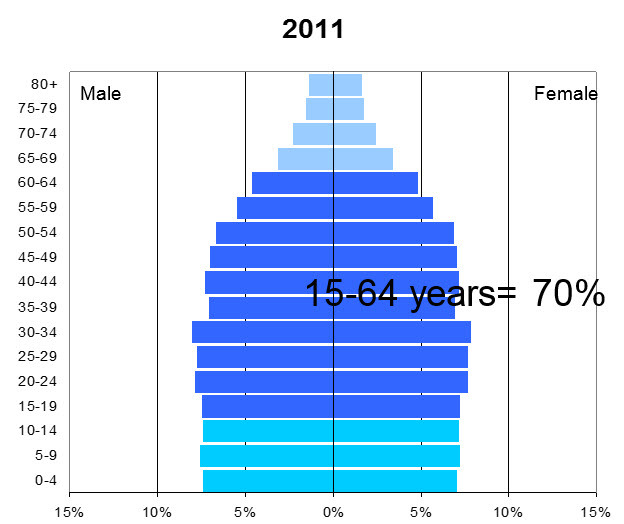 And the general shape is that of a cylinder, showing an even distribution of age cohorts. How unusual this is can be seen by comparing with the population structure of Bangladesh for the same year. Here, the shape is pyramidal, with lots more young people. And very few, above 65. A very useful way of looking at population structure is in terms of dependency, child and adult. Child dependency is the number of dependent children (below 15 years) as a percentage of the working population. Adult dependency is the dependent adult or elderly population (above 65 years) as a percentage of the working population. Higher the combined total the more dragged down and burdened the working-age people become, especially in a country like ours where social welfare mechanisms such as child care centers and long-term care facilities for the elderly are absent. High child dependency is bad, but high adult dependency is terrible. Again, the Sri Lanka data are easier to understand when contrasted with data from Bangladesh. Let’s take 60 percent as a magic number (though we could also take 50, 55, or even 65). Below 60 percent combined dependency is good; it allows the working population to concentrate on creating wealth, not putting its energies into taking care of children or the elderly. In Bangladesh, adult dependency is very low at this time; the lower life expectancy means that the elderly population is small. But child dependency is high, because of high fertility. But the latter is coming down fast. So combined dependency comes down to 60 percent just about now. And it keeps going down to below 50 percent in around 2021. To get back to 60 percent, it takes another 25 years. By this time, the composition of the dependency has changed, with more elderly to take care of versus children now. So this is the golden period for Bangladesh. According to demographic theorists such as David Bloom, if certain conditions are met, Bangladesh may experience double-digit economic growth driven by population structure alone. Now let us look at Sri Lanka. We’re already half way into our golden period (here’s the explanation for the 6 percent plus growth rates in the past few years), and ours will end much sooner, in around 2028. Because we have a much higher adult dependency rate, we should really think we have only about 10 years more of a lightly-burdened working population. If we do not use the golden years well, we will come face to face with the demographic danger, or demographic time bomb. With large numbers of the elderly (mostly women, because of the rapidly increasing gap between female and male life expectancy, now at more than 8 years) to look after with little help from government, the shrinking working population (by then smaller than the elderly group) will become less productive and entrepreneurial. The country will become mired in a low-growth stasis. In these conditions, out migration will increase, further reducing the working population. Instead of a virtuous cycle, we will now have a death spiral. So one should not simply look at the low-total-dependency period as an opportunity to grow the economy. It is like the seven years of plenty that preceded the seven years of famine. Those who use the good years well will survive the famine. Those who do not, will suffer the consequences. If the jobs are not available, a country may even see riots and rebellion from the boom generation. Most of our countries release the pressure by encouraging labor migration or giving make-work jobs in government. The latter is counter-productive, wasting resources that should be used for providing training and building infrastructure. If the infrastructure is in place, and the other conditions such as law and order are present, the boom generation’s entrepreneurial energy will create exports and jobs. The current solution of encouraging expatriate employment is sub-optimal because of the stresses placed on family life and the loss of multiplier effects of domestic employment. It is here that information and communication technologies can make a difference. In the past only agricultural and manufacturing goods could be exported. Now, because of telecommunications, it is possible to export (and where advantageous, import) services too. Certain information-intensive activities such as accounting and even interpretation of x-ray results can be done in locations distant from the office or hospital and communicated through telecommunication lines. This is business-process outsourcing (BPO). When BPO occurs between two countries, it is described as “offshoring”; when it occurs within a country, it is described as “inshoring.” The particular forms of BPO that are dependent on telecommunication connectivity and heavy use of information technology are described also as IT enabled services. Agriculture and manufacturing can create new and better-paying employment and exports by integrating ICTs into value chains: for example by ensuring traceability in the case of agriculture and improved logistics and customization in the case of manufacturing. Creating exports and high-quality, well-paying employment in agriculture, manufacturing and services by the integration of ICTs is essential to the realization of the demographic dividend. In addition, urgent action is needed on short-term measures such as increasing the retirement age, at least to 65, and bringing more women into the workforce. Sri Lanka is known for missing opportunities. Will we miss this too? Despite people like Dr Indralal de Silva highlighting these issues, political leaders seem uninterested. They seem to prefer to talk endlessly about who said what when and spend millions on sending us spam SMS that say absolutely nothing. At least in the Parliamentary election, for which this whole song and dance is but foreplay, let us hope there will be someone who will discuss substance. Rohan Samarajiva heads LirneAsia, a regional think tank. He was also a former telecoms regulator in Sri Lanka. To read previous columns go to the main navigation panel and click on ‘Choices’ category.